The package is located inside a disk image (.dmg) file that you first need to mount by double-clicking its icon in the Finder. It should then mount the image and display its contents. Before proceeding with the installation, be sure to stop all running MySQL server instances by using either the MySQL Manager Application (on macOS Server), the preference pane, or mysqladmin shutdown on the command line. Download the disk image (.dmg) file (the community version is available here) that contains the MySQL package installer. Double-click the file to mount the disk image and see its contents. Double-click the MySQL installer package from the disk. It is named according to the version of MySQL you have downloaded. 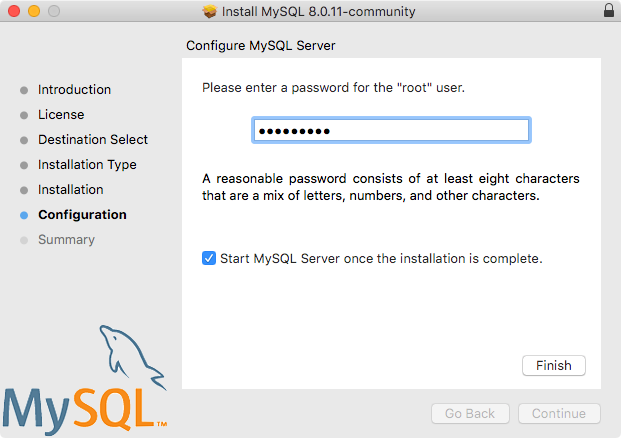 For example, for MySQL server 8.0.18 it might be named mysql-8.0.18-osx-10.13-x86_64.pkg. The initial wizard introduction screen references the MySQL server version to install. Click Continue to begin the installation. The MySQL community edition shows a copy of the relevant GNU General Public License. Click Continue and then Agree to continue. From the Installation Type page you can either click Install to execute the installation wizard using all defaults, click Customize to alter which components to install (MySQL server, MySQL Test, Preference Pane, Launchd Support -- all but MySQL Test are enabled by default). Although the Change Install Location option is visible, the installation location cannot be changed. 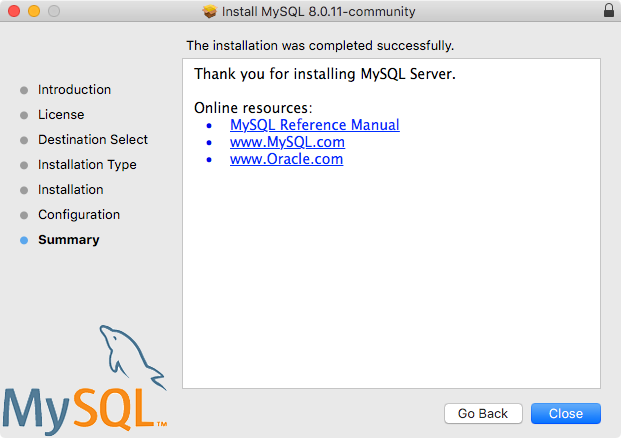 Click Install to install MySQL Server. 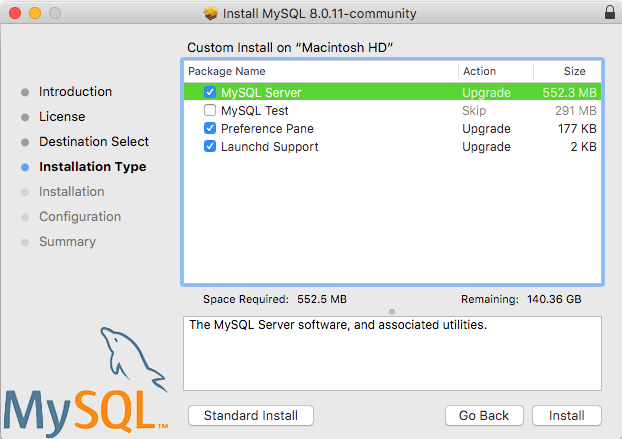 The installation process ends here if upgrading a current MySQL Server installation, otherwise follow the wizard's additional configuration steps for your new MySQL Server installation. After a successful new MySQL Server installation, complete the configuration steps by choosing the default encryption type for passwords, define the root password, and also enable (or disable) MySQL server at startup. 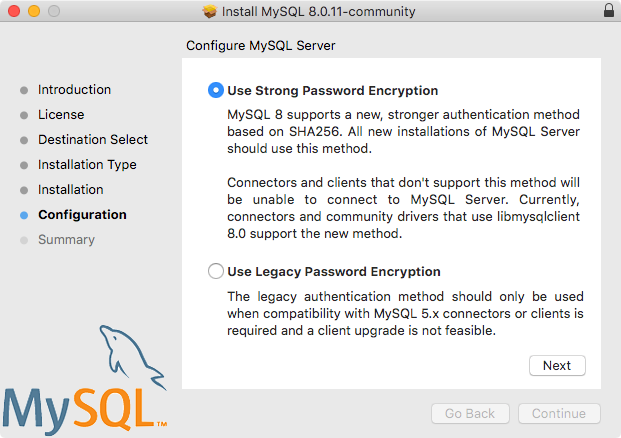 The default MySQL 8.0 password mechanism is caching_sha2_password (Strong), and this step allows you to change it to mysql_native_password (Legacy). Choosing the legacy password mechanism alters the generated launchd file to set --default_authentication_plugin=mysql_native_password under ProgramArguments. Choosing strong password encryption does not set --default_authentication_plugin because the default MySQL Server value is used, which is caching_sha2_password. Define a password for the root user, and also toggle whether MySQL Server should start after the configuration step is complete. Summary is the final step and references a successful and complete MySQL Server installation. Close the wizard. MySQL server is now installed. If you chose to not start MySQL, then use either launchctl from the command line or start MySQL by clicking "Start" using the MySQL preference pane. For additional information, see Section 2.4.3, “Installing and Using the MySQL Launch Daemon”, and Section 2.4.4, “Installing and Using the MySQL Preference Pane”. Use the MySQL Preference Pane or launchd to configure MySQL to automatically start at bootup. When installing using the package installer, the files are installed into a directory within /usr/local matching the name of the installation version and platform. 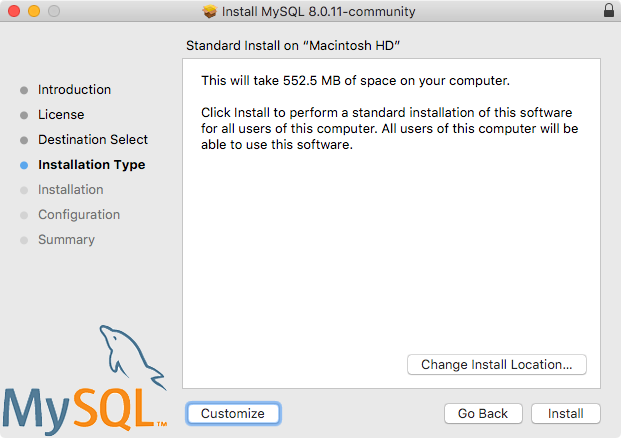 For example, the installer file mysql-8.0.18-osx10.13-x86_64.dmg installs MySQL into /usr/local/mysql-8.0.18-osx10.13-x86_64/ with a symlink to /usr/local/mysql. The following table shows the layout of this MySQL installation directory.